Jonathan Southworth "John" Ritter (September 17, 1948 - September 11, 2003) was an American television and movie actor and comedian. He was featured in the 1970s television series The Waltons. He performed in several situation comedies on the television, including Three's Company. He also appeared in It. Ritter was born in Burbank, California and died there on September 11, 2003 of aortic dissection caused by heart disease. He also did the voice for Clifford the Big Red Dog. Ritter was first married actress Nancy Morgan, from 1977 to 1996. Together they have three children, Two sons, Jason and Tyler who are also actors, and a daughter Carly. After divorced from Morgon, he later married actress Amy Yasbeck on September 18, 1999, at the Murphy Theatre in Wilmington, Ohio. Their daughter was born on September 11, 1998, one year before they married. Ritter's parents were Tex Ritter and Dorothy Fay. ↑ "Jason Ritter". Usmagazine.com. 2013-03-08. Retrieved 2014-12-12. ↑ "Jason Ritter Biography". Tvguide.com. Retrieved 2014-12-12. ↑ Lipton, Michael A. (December 16, 2002). "Acting His Age". people.com. Archived from the original on November 7, 2014. ↑ "John Ritter". CBS News. Page 5 of 17. Retrieved October 4, 2012. ↑ "John Ritter". CBS News. Page 10 of 17. Retrieved October 4, 2012. 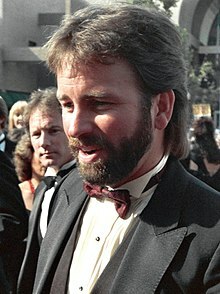 ↑ John Ritter Biography. Accessed 13 November 2014. This page was last changed on 19 October 2018, at 07:18.